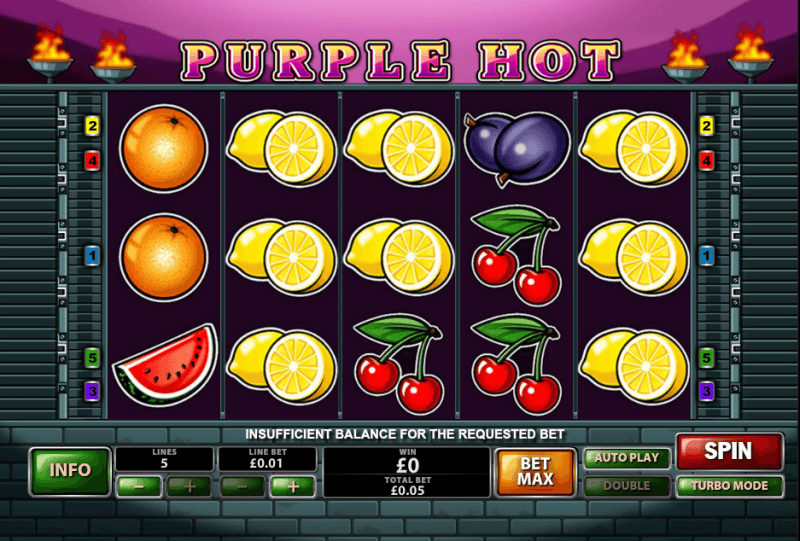 Purple Hot isn’t exactly a modern slot machine, despite its use of 5 reels. A lot of things about it are inspired by the classics, so you’re going to discover fruits as symbols, very few features and the minimum possible of paylines. If you’ve played Playtech slot machines in the past, and you trust them to create a great game, know that this isn’t one of those great titles which are a lot of fun. Purple Hot seems to be designed mostly with the fan of the classics in mind, giving them the option to play a bit of a hybrid between the oldies and the modern options. A very simple game, Purple Hot will only give you 5 lines on the 5 reels that it has. A scatter and multiple stacked symbols would make up the features offered. As for its best prizes, they go as high as $25,000 when they’re fixed, or a lot more when they’re from the progressive jackpot. There are features in Purple Hot, despite the fact that there are few of them. The presence of stacked regular symbols is one example, the scatter symbol is the other. That’s about it for the features of Purple Hot. One of the things I enjoyed in this game is the presence of stacked regular symbols. All the fruits come in stacks of three, so they take up anywhere between one and three spots on the reels. You don’t get paid too often as a result, but when you do get prizes they tend to offer you multiple wins at the same time. Only 5 lines exist unfortunately, so there is a limit to how useful these stacked symbols can be. The other feature of Purple Hot is a scatter symbol with a few bananas on it. This is a symbol which offers prizes that vary between 2x and 50x the triggering bet, when you have between three and five present at the same time. The cool thing about them is that they can be anywhere, it doesn’t matter to the game, it still gives you those prizes. Since you have only 5 lines to cover, you don’t need a lot of coins to wager. 5 coins are enough and their value can be in the range of $0.01 to $5. The maximum bet is worth $25. 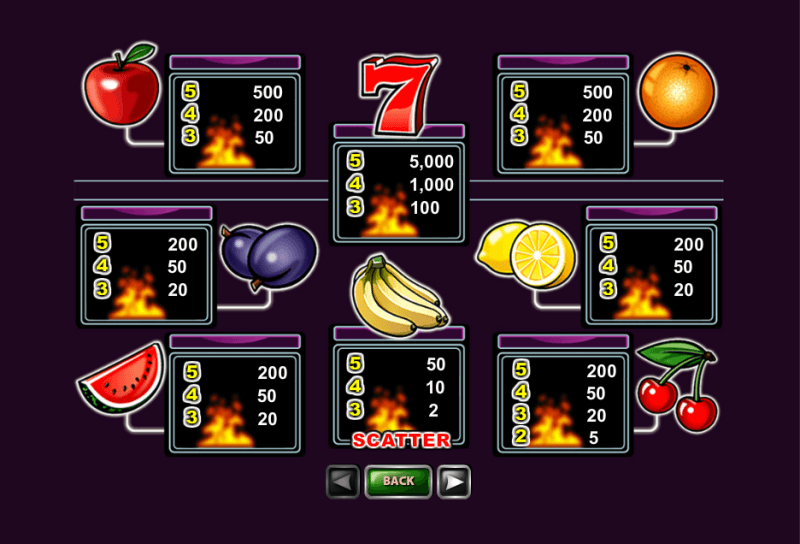 If you’re looking at the fixed prizes, the red 7 can form a combo of five which pays 5,000 coins ($25,000). 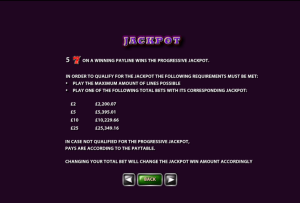 However, there is also the progressive jackpot to consider, offered by the same red 7 icon. You need to cover all the lines with your bet to get it, but the line bet doesn’t have to be the biggest one. If you use a bet of $2, $5, $10 or $25, the progressive jackpot will be yours (how much of it you get depends on that wager size). The game is just as boring as the choice of symbols. With so many fruits present and with only a few paylines, it looks like the hundreds of other slots that exist out there and which use classic icons. The outside area is pretty simple, with a metallic looking wall on both sides, so there is nothing there to make the design more interesting. Symbols: Bananas (scatter, 50x the bet), Red 7 (5,000 coins), Red Apple (500 coins), Orange (500 coins), Plums (200 coins), Lemon (200 coins), Watermelon (200 coins) and Cherries (200 coins). 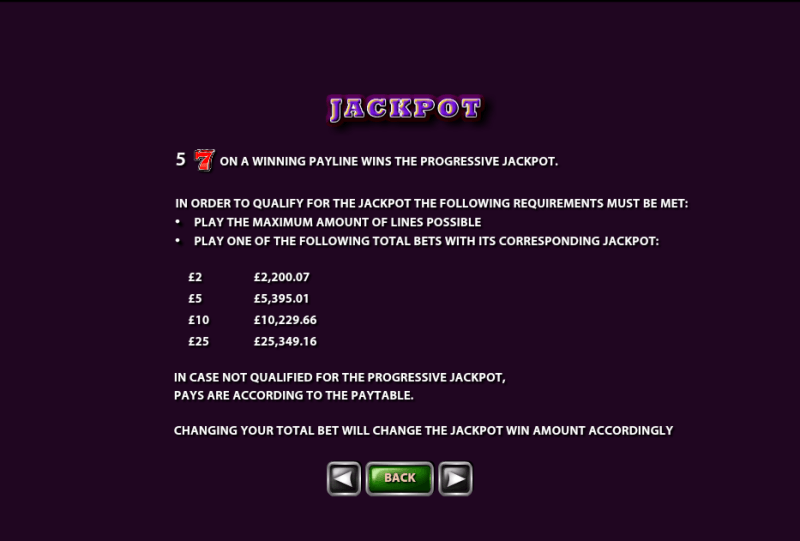 The simple theme will not be enjoyed by too many people, but the progressive jackpot might just change their mind. 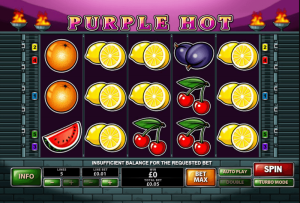 This Purple Hot slot is offered by all online casinos with Playtech software, playable either in practice or in real money mode.